Notwithstanding its status as coffee capital, classic afternoon and high tea Melbourne has become one of the stylish things to do - asserting the classy and charming English tea drinking and fine food tradition within Melbournes multicultural melting pot. Afternoon tea is an English ritual also known as low tea. It is a light meal eaten mid afternoon, consisting of brewed tea with milk and sugar, accompanied by sandwiches, scones, cakes and pastries, and served in the sitting room. The words 'low' and 'high' refer to the tables from which either meal was eaten. High tea, also known as meat tea, is an early evening meal eaten in the dining room. It consists of cold meats, eggs or fish, cakes and sandwiches. However this is not to be confused with what many Australians refer to as tea. When they say tea, they mean actual dinner. The resurgence of afternoon and high tea Melbourne appears to let some of us relive the glamour and hassle-free times of the past. You can get dressed up and spend all afternoon treating yourself to dainty cakes and fabulous tea. In Melbourne, it is primarily the elegant and sophisticated afternoon teas that are served by large classy Melbourne hotels and some independent tea rooms  some of them from mid morning. Booking is recommended. There youll get aromatic leaf tea, cucumber, egg, cress and salmon sandwiches and petits fours - small delicate confection, such as dainty biscuits, baked meringues, macaroons and puff pastries. These are served on elaborate silver tiered trays ensuring the right ambience for glamorous afternoon teas. 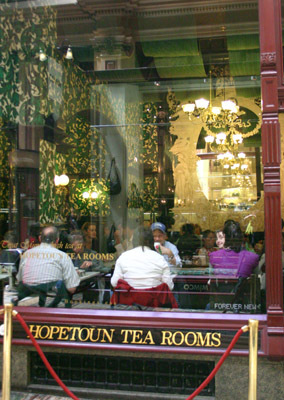 One of the High Tea Melbourne venues not in a hotel is the Hopetoun Tearooms. They have been serving traditional quality High Tea in the refined elegance of the Block Arcade for more than a century. The charm there is the cosy arcade atmosphere with a window to the arcade and passers by. 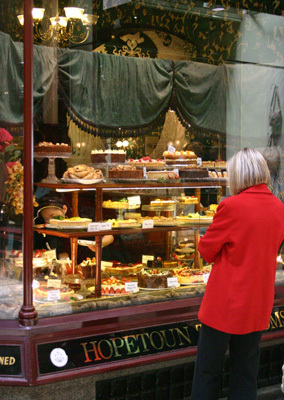 As you stroll by, you can admire the Hopetoun splendours in their window, line up in English fashion along a satin rope for your spot on a high tea table, or simply buy some of their delicacies to take away. The Hotel Windsor is one of the most glamorous venues for you afternoon tea. They have been following this very fine English tradition for over 100 years. Youll get the charming three-tiered silver stands, freshly baked scones with jam and cream, exquisite pastries and finger sandwiches as well as sparkling wine to start you off. The Sofitel offers a more dynamic afternoon tea with a live savoury cooking and crepe station on weekends. This is an extra to the mid-week version of elegant finger sandwiches, hot and cold savouries, scones, cakes, pastries and desserts and glass of sparkling wine. At the Lanham you can indulge in traditional Tiffin afternoon tea. Tiffin refers to a light lunchtime meal  and this is available from mid morning into the afternoon. Again, served in nostalgic tradition on three tiered silver stands, it includes traditional scones as well as modern twists on old English favourites. They also offer a Chocolate Indulgence version with a selection of delicious chocolate treats along with the afternoon tea. At the Grand Hyatt you can get a grand experience of modern high tea. Its like a dreamland and food heaven with savoury sandwiches, scones and cakes, as well as an endless choice of handmade deserts, chocolates, macaroons, toffee apples, fresh waffles and ice cream. Just an hour from Melbourne on the Mornington Peninsula, you can enjoy High Tea at the Woodman Estate on Sunday afternoons. You can forget life and haste, while enjoying all the bits and pieces that make up a traditional afternoon tea in a relaxed atmosphere.